STAROHNATIVKA, Ukraine -- Ukraine on Wednesday reported intense battles with pro-Russian insurgents near the last major government stronghold in the former Soviet country's separatist east. Tanks of pro-Russian separatists on the road from Donetsk to Novoazovsk, Mariupol district on February 24, 2015. A military spokesman in Kiev said clashes north of the Sea of Azov port of Mariupol had killed one soldier and injured three. The rebels reported the death of a civilian in a different part of the Russian-speaking war zone. The latest battles are focused on the control of a highway linking Mariupol with the separatists' de facto capital Donetsk. Most of the road is currently overseen by government forces. Its access could potentially help the insurgents step up their stop-start campaign to capture Mariupol. The industrial port of nearly half a million exports most of the east's factory output and provides a land bridge between rebel territories and the Russian-occupied Crimea peninsula. One resident of a village situated about half way between Donetsk and Mariupol said the exchanges of heavy mortar and rocket fire started on Monday and had not ceased since. "It has been three days now -- day and night," said a pensioner who identified himself only as Andrei out of security concerns. A local military spokesman said the two sides were now waging one of their most intense and continuous battles since the signing of a shaky ceasefire deal in February. 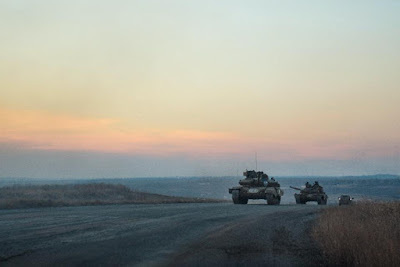 "We are giving the enemy's artillery fire a sufficient and equally heavy response," local government forces spokesman Yaroslav Chepurniy told AFP. "If they grab this territory, they will take Mariupol itself." The United Nations estimates that the conflict -- sparked by the February 2014 ouster in Kiev of a Moscow-backed president -- has killed more than 6,800 people and driven at least 1.4 million from their homes. Russia continually lies and denies accusations by Ukraine and its allies of orchestrating and supporting the conflict to try to prevent the former Soviet state establishing closer ties with the West.